The University of New Mexico School of Architecture and Planning and School of Engineering took first place in the Design-Build Institute of America (DBIA) 2015 National Design-Build Student Competition, presented by the only organization that defines, teaches and promotes best practices in design-build. The only other student teams that advanced to the final round were the University of Washington and University of Colorado – Boulder. The three student finalist teams competed in front of a live jury and audience at DBIA’s Design-Build Conference & Expo in Denver, Colo. The teams presented before a panel of interviewers – mirroring the second phase of a true design-build competition – to answer questions and defend their design and construction plans for a science building on a college campus. The final winner, the University of New Mexico, was announced by the national jury during the morning general session. “Here at the University of New Mexico, we have a wealth of student talent and knowledge in the area of Design Build process through the School of Architecture and Planning and School of Engineering," said Kristina Yu, professor of architecture, SA+P. "We can look forward to the impact these students will have in architecture, design and construction, as they advance into the professions. Expect great things! This competition is only one of several interdisciplinary projects, research and studies between the SA+P and SOE to develop stronger, higher-skilled professionals. 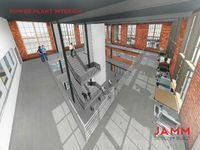 An interior perspective of the renovated power plant on the site. It was renovated to include an Earth Sciences Program for Pomona College. The competition began at the regional level with 31 teams of students from 26 universities from across the country competing. Student teams from leading design, construction and engineering universities across the country entered the competition to demonstrate design-build best practices by proposing a delivery solution to design and construct a more than 46,000-square-foot science building on the liberal arts campus of Pomona College in Calif.
Nine regional winners were selected to compete in the second phase of the competition based on their response to the initial RFQ. An RFP was then issued to those nine and the top three finalists were selected based on their responses.